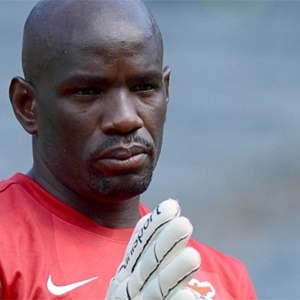 Cape Town - Zambia and Mamelodi Sundowns goalkeeper Kennedy Mweene says his homework paid off when he saved Algeria forward Riyad Mahrez's penalty kick on Tuesday night. Mweene stopped Mahrez from converting a 15th minute penalty in their World Cup qualifying game in Algeria, after a foul by Fackson Kapumbu. Chipolopolo went on the claim a 1-0 victory thanks to Patson Daka's goal 25 minutes from time, that win following their 3-1 triumph over the Fennecs in Lusaka on the weekend. The six points gained means Zambia trail Group B leaders Nigeria by three points, with two matches left to play. Mweene, who excelled for Zambia in their AFCON-winning campaigns of 2012, has stopped penalties from some of Africa's biggest stars, including Asamoah Gyan, Didier Drogba, Gervinho and Kolo Toure. And the 32-year-old Sundowns shot-stopper says the save on Mahrez's spot kick was no fluke. "As a goalkeeper when you are going to play with a player like that you want to see their weaknesses as well," he told the Zambian Football website. "I guessed right, I knew he was going that side that's why I went full out in that direction." Zambia face Nigeria away on October 7 and end their 2018 World Cup qualifying campaign with a home match against Cameroon on November 6.